2018 was a great year for us because you chose us as a trusted partner. We still have to try more to bring you a better service with awesome products in 2019. Traditional Lunar New Year 2019 Holiday is coming. 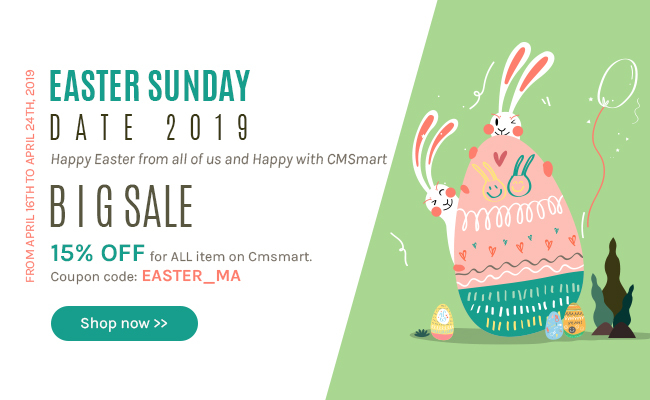 In this occasion, we will discount 19% on all items on Cmsmart with coupon code TET2019 to show gratefulness to our beloved customers from now to 12th, Feb 2018. Cmsmart is going to celebrate Lunar New Year from 2nd to 10th February 2019. Therefore, we have 9 days OFF at this time and we would like to inform you about this event in advance. During the time, we are sorry for any inconvenient of supporting which cause by us, hope you understand if your ticket is not responded promptly. With urgent issues, we will try to support you soon as soon as possible, please feel free to leave the ticket. Enjoy warm atmosphere holiday with Cmsmart and save 19% on all items now!! !